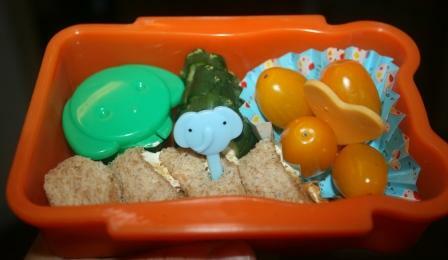 Two Bears Farm and the Three Cubs: First Ever Attempt at Bento! First Ever Attempt at Bento! Pierce started preschool this week. One of the things I was excited about was packing his lunches. Pierce's lunches have to be kosher, so he can have dairy products but no meats. I wanted to make them extra fun, so I've been ordering tons of bento supplies from Japan through Ebay. I'm still waiting on a few things to arrive. Then, something really cool happened; I got lucky. Because I won this awesome bento goodie giveaway over at A Pocket Full of Buttons. Go check her out HERE. Can't wait to put these things to good use. 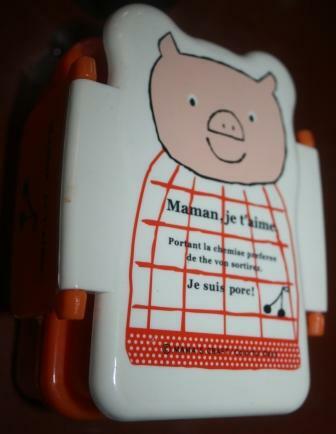 So for Pierce's first bento lunch, I picked the piggy bento box that we ordered from Japan. It's a double tiered bento. 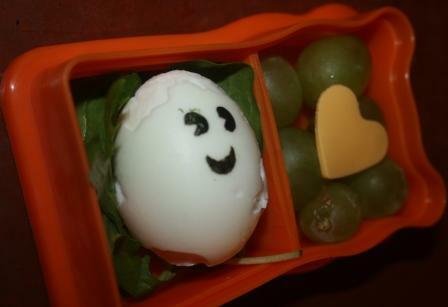 In the top tier, he had a ghosty egg on a bed of lettuce, and grapes with a cheese heart. The bottom tier had fluffernutter roll ups with an elephant pick, yellow cherry tomatoes with another cheese heart, cucumbers, and a dog full of ranch dressing for dipping his veggies. On the side Pierce had some go-gurt (which grosses me out but he loves it) and a Roarin' Waters Capri Sun. I am buying Pierce a box of Ritz crackers. Why does his lunch have to be kosher? I would try to steal his lunch. 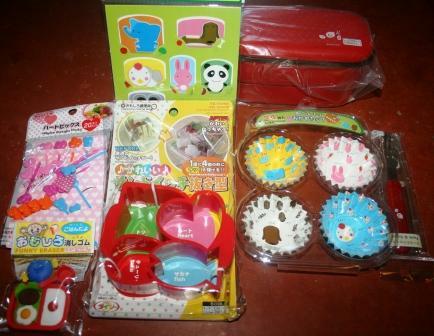 Congrats on winning the bento stuff!! How lucky! love the piggy! Where did you order it from? so cute! How cute is that!!! What a great way to make his lunch fun! What cute ideas. I run a preschool in my home, so I am going to keep coming back to see what fun ways you've come up with to serve food. I grew up on sandwiches, but my kids aren't so regular. I stopped in from Mom Loop. Glad I found your blog!